Online traffic from mobile phone users is on the rise and is set to outrank PC use in the very near future. According to Nielson Research, mobile Internet use increases approximately 30% per year. Nielson also stated that, by the end of 2013, there will be approximately 134 million mobile web users in the United States. We aren’t surprised. The culture of the 21st century is very fast-paced and people must have instant access wherever they go. Searchers using mobile to help make a decision are 30% more likely to visit a retail website. Usability is also an important reason. Obviously there is a big difference in the screen size between a PC and a smartphone. Most PC monitors are 19 inches or larger; however, most smart phone screens are only approximately 3.5 inches. Your customers will appreciate the ease of loading a mobile website on their phone as opposed to trying to use a PC-optimized website. By the end of 2013, your current marketing may look outdated without the addition of a mobile website. You may have been asking yourself if you could afford to add a mobile website to your current marketing strategy. 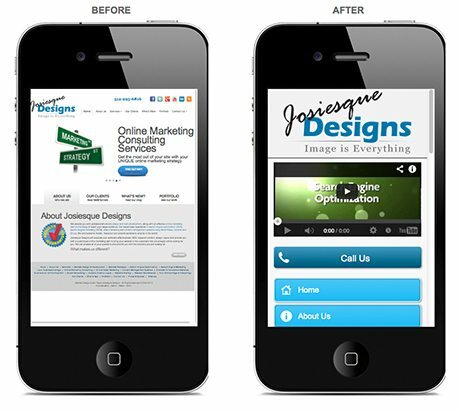 With the ever increasing use of smartphones, the question is quickly becoming “Can you afford NOT to add a mobile website?” Josiesque Designs can help you enter the mobile market with affordable mobile website design options. ***UPDATE: As of December 2014, Google has begun to reward websites with responsive design as opposed to ones the have a different mobile version of their site all together. Learn more about our Responsive Design services and how it will benefit your business.